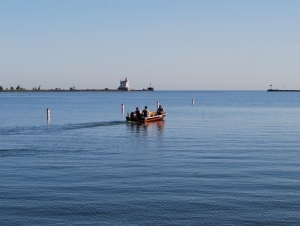 The Great Lakes Center at Buffalo State has been awarded $2.7 million from the Environmental Protection Agency (EPA) via sub-contract through a collaboration with Cornell University. The grant, “Great Lakes Long-Term Biological Monitoring Program: Zooplankton, Benthos, Mysis, and Chlorophyll-a Components for 2017–2022,” continues a monitoring program in the open waters of all five Great Lakes. The EPA Monitoring Program is designed to provide managers with access to biological data on zooplankton and benthos to support decision-making. The entire grant of $5.9 million was awarded by the EPA Great Lakes National Program Office and the Great Lakes Restoration Initiative. Lars Rudstam, director of the Cornell Biological Field Station, is the principal investigator. Lyubov Burlakova, senior research scientist, and Alexander Karatayev, director of the Great Lakes Center, are co-principal investigators of Buffalo State’s subcontract responsible for benthos collection and identification, and analysis of long-term trends in the benthic community. They will make the data available to environmental and fisheries managers and other stakeholders. Burlakova will provide project leadership and oversight, taxonomic expertise, and grant management. Karatayev, an internationally renowned expert in fresh-water ecosystems, will oversee and participate in sample collection, and provide taxonomic expertise. Both scientists have an extensive publication record outlining their expertise in Great Lakes benthic fauna. This contract is administered by the Sponsored Programs Office, which has moved to Buckham Hall B206.